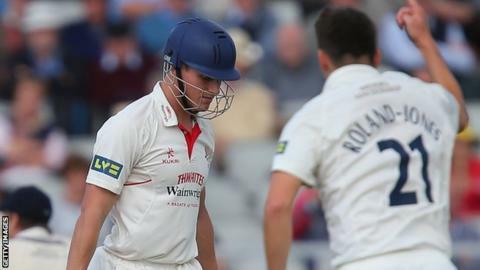 Lancashire batsman Luis Reece broke his hand after an incident in the dressing room, says cricket director and head coach Ashley Giles. The 24-year-old left-handed opener managed scores of 16 and two as the Red Rose lost for the first time this season against Gloucestershire. Asked how Reece broken his hand, Giles, 42, told BBC Radio Lancashire: "I'm not quite sure yet." Reece has two ducks already this season and averages just 8.57 so far. "I'll have to look into that situation and I can let you know when the time's right," added Giles. "I need to speak to him, get to the bottom of it and see where we go." Australian bowler Peter Siddle played his last game for Lancashire before joining up with the Australia squad for their tour to the West Indies ahead of the Ashes. When questioned about Siddle's return after the Ashes series, Giles said: "It's a possibility, he'll be in the country. "I hope he plays a part in the Ashes, but if he doesn't he might be raring to have a few more overs so we're probably in the pound seats as he's been with us. "He's been fantastic. He's only been here for four games but he's had a really big impact on the dressing room and on the field."